This is a vertical scrolling shooter game with a futuristic theme. 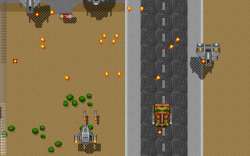 As is typical for the genre, the player's main objective is to fight waves of enemy airborne fighters, ground vehicles and defence installations while dodging their attacks and picking power ups. The player's ship is equipped with two weapons: the Mini Missiles, which are the default unlimited ammo weapon, and the Quadro Laser that produces a fan of projectiles and uses up energy. Picking capsules replenishes energy for either the ship's shields or the laser weapon. It was created as an entry for the 32 kilobyte game development competition that was part of the Mekka 97 demoscene event which took place in Germany in March 1997. Because of this limitation in size, the game does not have any title screen, options configuration screen or a high score table; the score achieved after each playing session is displayed in the DOS prompt upon exit. No background story is provided in any form either. The size still allowed for a number of different enemy ships and tanks, and background music.